OVER 3,050 violent or sexual crimes were reported to the police across Northern Ireland in just one month of this year – equivalent to 102 incidents per day. The offences include common assaults, grievous bodily harm and sexual offences. The map above shows all of the crime and anti-social behaviour incidents reported to the Police Service of Northern Ireland (PSNI) during September of this year. A total of 14,577 were recorded. 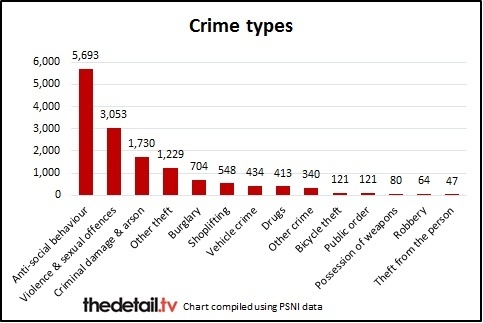 This is the most recent crime data published by the PSNI. However, as only around a half of crimes are thought to be reported to the police, our map provides only a snapshot of the total crime which takes place in reality. The largest category of crime reported in September 2014 was anti-social behaviour – with 5,693 incidents reported across the 30 day month. This works out as an average of 190 personal, environmental or nuisance anti-social incidents reported each day. There were 1,730 cases of criminal damage and arson which equates to 58 of these incidents per day across September. This category includes damage to buildings and vehicles and deliberate damage by fire. The map above shows the approximate location of every crime recorded. The exact location is not revealed to protect the identity of victims of crime. All of the data is anonymised before being uploaded to the website. Ninety-five crimes could not be mapped as the location information was not available. Readers can explore the map to examine how crime types feature across Northern Ireland or zoom in to read more on all of the crime reported in September in the areas they live or work in. Multiple crimes were recorded during the month in many single locations. 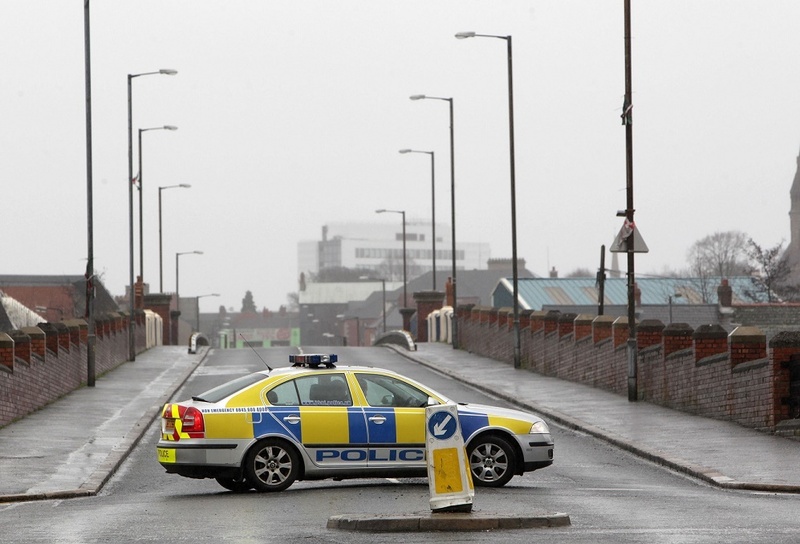 Of the 38 crimes recorded ‘on or near Botanic Avenue’ in Belfast – 17 involved anti-social behaviour, six were shoplifting, there were three violence/sexual offences, one robbery and two drugs related incidents. The 32 crimes reported as taking place ‘on or near Royal Avenue’ in Belfast included 14 anti-social behaviour incidents, 10 cases of shoplifting, two violent/sexual offences and three incidents of criminal damage. There were 27 crimes recorded ‘on or near Victoria Square’ in Belfast. These included seven drugs related crimes, three shoplifting cases, four ‘other theft’ and seven cases of violence/sexual assault. The 17 crimes recorded ‘on or near Shipquay Street’ in Derry include seven cases of violence/sexual offences, four incidents of anti-social behaviour and two drugs crimes. One hundred and sixty-eight crimes were recorded ‘on or near Main Street’ in September but this covered many towns and different locations. A single crime was recorded at 2,603 of the location points. Results from the most recent – 2012/13 – Northern Ireland Crime Survey (NICS) estimate that almost 11% of all households and their adult occupants were victims of at least one crime during the 12 months prior to being interviewed for the survey. Just over half (52%) of all crimes experienced by the people surveyed were reported to the police, an increase from 44% in 2011/12. Burglary has the highest reporting rate. The NICS authors said this reflects the seriousness of the incidents and the associated likelihood of insurance claims. The most common reason cited in the NICS by respondents for not reporting a crime to the police was “too trivial / no loss / police would not / could not do anything” (71%). This was followed by “private matter / dealt with the matter ourselves” (17%) and “inconvenient to report” (15%). Victim Support Northern Ireland provides emotional support, information and practical help to victims, witnesses and others affected by crime. The charity’s community services manager Jolene Welsh said: “No two people will experience crime in exactly the same way. It can have devastating consequences for some people. She continued: “We have experienced an increase in referrals for sexual offences since the opening of The Rowan sexual assault referral centre in Antrim. “We have also experienced an increase in uptake of our services from people who have experienced fraud and internet crime. “We continue to support people impacted by all crime categories such as burglary, anti-social behaviour, hate crime, murder, etc. Accessing Victim Support NI’s services is not dependent on reporting the crime to the police. For more detailed information on how the PSNI crime data was produced, click here. The PSNI also produces regular crime maps focusing in on Northern Ireland areas. Search for your postcode here. Victim Support NI’s Belfast helpline can be contacted on (028) 90243133. It operates 9am-5pm Monday, Tuesday, Wednesday and Friday and 9am-8pm on Thursdays.